Olympic Flame in Berlin, 1936 by Josef Jindřich Šechtl via Wikimedia Commons (CC by 2.5). Colorized by PHS. Eighty years ago, participation in the 1936 Summer Olympics, held in Berlin, was much less certain. The International Olympic Committee awarded the Games to Berlin in 1931, two years before the Nazi Party came to power in Germany. Hosting the games provided the Nazi government the chance to showcase Germany’s development into a strong, modern nation following the devastation of the First World War. It also provided a distraction from the increasingly inhumane policies designed to purify the German population by excluding Jews and other minorities from all aspects of German life, including the realm of sport. The use of the games as propaganda for this terrible regime was greatly disturbing to observers such as Henry Smith Leiper, a leader in the international ecumenical movement who traveled extensively through Europe in the 1930s. He reported his observations of the changes in German secular and religious life, as well as his growing apprehension about the Nazi government, in a series of detailed letters sent home to family and friends. For Leiper and his fellow delegates at the 1935 summer meetings of the Universal Christian Council for Life and Work and the World Alliance for International Friendship through the Churches, the situation of the German Church and the Reich’s treatment of minorities were major topics of concern. In late August, he traveled to Berlin to look into the recently closed American Church in Berlin, and to meet with German church leaders, academics, and expatriate friends. Letter from Henry Smith Leiper, August 30, 1935, Leiper Family Papers, RG 490-9-28. Read the full letter here. Access via Pearl here. As Berlin’s preparations for the Olympic Games progressed, individuals and organizations around the world began to raise their voices in protest of this great symbol of fair competition and international friendship being hosted by a regime whose policies were grounded in anti-Semitism and racism. In the United States, opposition to holding the Games in Berlin was expressed by Jewish and Catholic organizations, and by the American Federation of Labor, the National Association for the Advancement of Colored People, and in the editorial pages of the New York Times, Commonweal, and the Christian Century. Returning home from Europe in the fall of 1935, Leiper joined a group of 46 religious, civic, business, political, and sports leaders in the newly formed Committee on Fair Play in Sports. He served as co-chair of the committee, along with George Gordon Battle, a prominent New York lawyer and an outspoken advocate against anti-Semitism. Other Committee members included Dr. Franz Boas, Massachusetts Governor James M. Curley, Dr. Harry Emerson Fosdick, Senator Carter Glass, Arthur Garfield Hays, Dr. Reinhold Niebuhr, Rev. A. Clayton Powell, Jr., Norman Thomas, and Dr. Mary E. Woolley. The Committee was determined to expose Nazi discrimination and to ensure “No American Participation in the Olympic Games under Nazi Auspices,” as the group’s letterhead declared. The Committee organized a speaker’s series on German politics and the Olympics, they encouraged clergy to speak to their congregations in favor of non-participation, and they broadcast radio addresses explaining their reasoning for a boycott. After a lengthy debate at its December 9th annual convention, the AAU voted down Mahoney’s bid to withdraw the U.S. team from the Games. 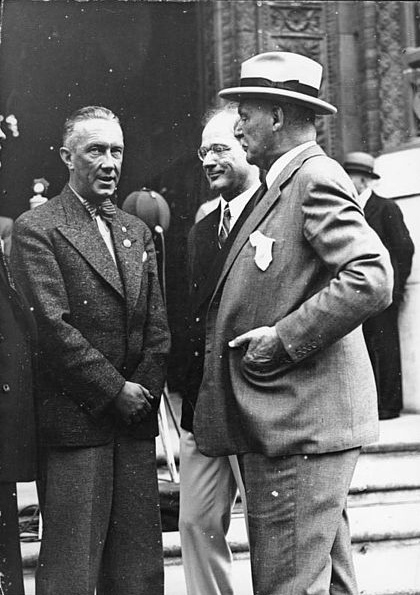 After this defeat, Mahoney declined to stand for reelection; he was succeeded as president by Avery Brundage, one of the staunchest backers of American participation in the 1936 Olympics. "The Olympic Games in Berlin: A Question of Fair Play,” radio address, November 12, 1935, Leiper Family Papers, RG 490-6-14. Read the full address here: Part 1, Part 2, Part 3. Access via Pearl here. 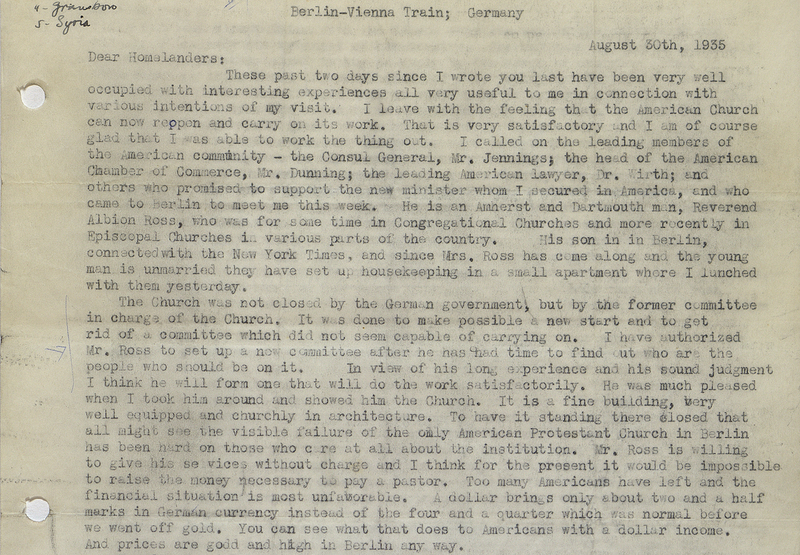 Letter to “Dear Homelanders,” August 30, 1935, Leiper Family Papers, RG 490-9-28. 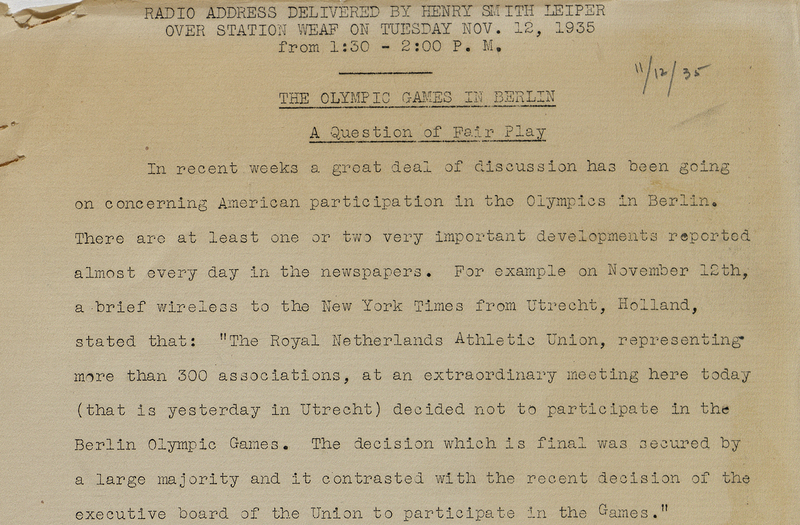 “The Olympic Games in Berlin: A Question of Fair Play,” radio address, November 12, 1935, Leiper Family Papers, RG 490-6-14. “Opening Address of Dr. Henry Smith Leiper,” December 3, 1935, Leiper Family Papers, RG 490-6-14. Letter to “Dear Homelanders,” September 7, 1936, Leiper Family Papers, RG 490-9-28.